﻿As part of the BBC’s continued commitment to arts and music, BBC Two and BBC Four are delighted to announce a ballet season this March, which brings together rare archive footage with original insights from leading figures in the ballet world, exploring the extremes the human body goes through to create high art and the power of ballet to transform lives. Highlights of the season include rediscovered footage of Margot Fonteyn dancing in Fonteyn ’59: Sleeping Beauty (BBC Four); classic dancers who inspired the great Darcey Bussell in Darcey’s Ballerina Heroines (BBC Two); Dancing In The Blitz: How WW2 Made British Ballet featuring rare footage presented by choreographer and Artistic Director, David Bintley (BBC Four); and prima ballerina Tamara Rojo on the trials and joys of Swan Lake in Good Swan, Bad Swan: Dancing Swan Lake (BBC Four). Prima ballerina Darcey Bussell will introduce an edited hour of the highlights from Sleeping Beauty, a hidden treasure of the BBC archive featuring legendary ballerina Margot Fonteyn in the leading role, in this unique performance from the 1950s. 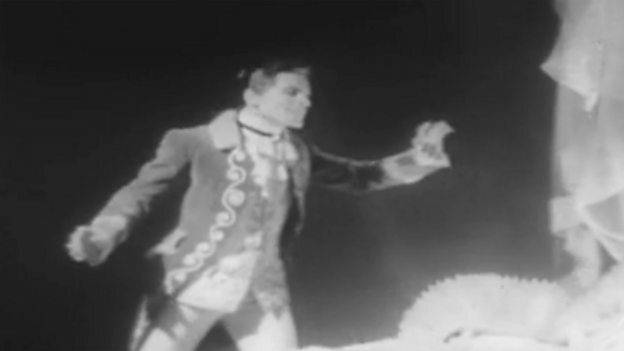 The original BBC Television version was specially produced and shot in a studio for TV broadcast but some years later footage of Act II was lost. Act II is the iconic moment when in the fairy tale ballet, the prince awakens Sleeping Beauty from her 100 year sleep with a kiss. In this special re-worked version of the ballet for BBC Four, Fonteyn ’59: Sleeping Beauty, will show footage the rediscovered kiss sequence. Sleeping Beauty was initially shown on 20 December 1959 and was cut down in to a special edited version for television – the performance featured stars of The Royal Ballet, Margot Fonteyn and Michael Somes and was filmed for the archive. However, when the films were called up in research for the BBC Ballet Season, it became apparent that Act II was missing and the set of six film cans erroneously contained two copies of Act I. After a few months of dogged searching the BBC landed an important discovery. Film researchers came across a ‘Master set’ of six film cans, labelled as ‘A Rolls’ and, after many false starts, finally discovered the one surviving copy of the elusive Act II. As part of the BBC Ballet Season, this reworked for television Sleeping Beauty (60 minutes) is believed to be the first time British audiences will have had a chance to see extracts from the ballet including the illusive Act II since the live transmission in 1959. This rarely seen film will give viewers a glimpse of an authentic 1950s style of ballet, transporting viewers back to the living rooms of post-war Britain. The 95-minute reassembled ballet will be available to view online in addition to the 60-minute BBC Four version. Darcey Bussell tells the stories of the amazing ballerinas who inspired her and made ballet what it is today. Bussell spent two decades at the top, performing all the great roles in the classical repertoire and becoming one of ballet’s most famous faces. In this film she explores the history of the ballerina through the female ballet stars who came before her. Travelling from Versailles in France to the Winter Palace in St Petersburg and back to Covent Garden the theatre which welcomed Darcey’s earliest dance heroine, Marie Sallé, nearly 300 years ago in 1734. The documentary explores the changing role of the ballerina, examining the challenges that Darcey’s predecessors encountered, discovering the women who broke the rules and reveal what it takes to be one of the greats. David Bintley, Director of the Birmingham Royal Ballet, explores how the Second World War was the making of British ballet and how fundamental the years of hardship and adversity were in getting the British public to embrace ballet. Bintley shows how the then Sadler’s Wells Ballet Company (later to become The Royal Ballet), led by Ninette de Valois and featuring a star-studded generation of British dancers and choreographers including Margot Fonteyn and Frederick Ashton was forged during the Second World War. It's the story of how de Valois and her small company of dancers took what was essentially a foreign art-form and made it British despite the falling bombs, the rationing and the call-up. It’s also the story of how Britain, as a nation, fell-in love with ballet. Using rare and never-before-seen archive, plus interviews with dance icons such as Dame Gillian Lynne and Dame Beryl Grey, Bintley shows how the Sadler’s Wells Ballet survived an encounter with Nazi forces in Holland, dancing whilst the bombs were falling in the Blitz, and how they managed on rations to bring ballet to the British people. Their role in the war became the antidote to the austerity the country faced. During his interview for Dancing In The Blitz, another of the original 1946 dancers, Henry Danton, when talking about rehearsals for the ballet, remembered it had been filmed by an amateur cameraman in colour. Thanks to the BFI archivists this extraordinary footage was uncovered and has now been restored and clips of this restored version will be shown as part of the programme on BBC Four for the first time in over 60 years! Tamara Rojo, world-famous ballerina and Artistic Director of English National Ballet, will take viewers backstage as she prepares for one of classical ballet’s biggest challenges, the dual lead in Swan Lake. It is the ultimate role for any dancer requiring her to play the completely contrasting characters: Odette the White Swan, and Odile, the Black Swan. The role demands not only superlative acting skills, but extreme stamina and the ability to master complex choreography, as well as the awe-inspiring capacity to dance 32 fouetté turns perfectly. With unprecedented access, the disarmingly candid Rojo reveals her insights on the role’s physical and psychological challenges. She takes us into the hidden world of the corps de ballet, and through demonstration and masterclass she reveals how to read the choreography of some of Swan Lake’s most famous scenes. Along the way, Rojo gives us a glimpse of Swan Lake’s history – its genesis through to 21st century incarnations. She looks back at some of the greats that inspired her (including the Bolshoi’s soviet star Galina Ulanova and legendary Natalia Makarova), and leads the way forward, coaching the next generation of rising stars who bring their own fresh interpretation. Beyond the dancing, Rojo examines some of the reasons behind Swan Lake’s extraordinary success, such as Tchaikovsky’s captivating and innovative score, and how the remarkable collaboration of two great choreographers – Marius Petipa and Lev Ivanov - fused the formal and naturalistic to create a phenomenon unseen before in the history of ballet. Swan Lake is one of classical ballet’s best-loved and most popular stories – a lyrical and tragic fairytale with spellbinding choreography that continues to challenge the world’s greatest dancers. Through rehearsals, performance, interview, and specially filmed workshops, this film celebrates Swan Lake as an evolving and living work of art – the ultimate classic.